Both are voltage-controlled field effect transistors (FETs) mainly used to amplify weak signals, mostly wireless signals. They are UNIPOLAR devices which can amplify analog and digital signals. A field effect transistor (FET) is a type of transistor that alters the electrical behavior of a device using an electric field effect. They are used in electronic circuits from RF technology to switching and power control to amplification. They use electric field to control the electrical conductivity of a channel. FET is categorized into JFET (Junction Field Effect Transistor) and MOSFET (Metal Oxide Semiconductor Field Effect Transistor). Both are mainly used in integrated circuits and are quite similar in operating principles, but they have a slight different composition. Let’s compare the two in detail. JFET is the simplest type of field-effect transistor in which the current can either pass from source to drain or drain to source. Unlike bipolar junction transistors (BJTs), JFET uses the voltage applied to the gate terminal to control the current flowing through the channel between the drain and source terminals which results in output current being proportional to the input voltage. The gate terminal is reverse-biased. It’s a three-terminal unipolar semiconductor device used in electronic switches, resistors, and amplifiers. It anticipates a high degree of isolation between input and output which makes it more stable than a bipolar junction transistor. Unlike BJTs, the amount of current allowed is determined by a voltage signal in a JFET. N-Channel JFET – The current flowing through the channel between the drain and source is negative in the form of electrons. It has lower resistance than P-Channel types. P-Channel JFET – The current flowing though the channel is positive in the form of Holes. It has higher resistance than its N-Channel counterparts. MOSFET is a four-terminal semiconductor field effect transistor fabricated by the controlled oxidation of silicon and where the applied voltage determines the electrical conductivity of a device. MOSFET stands for Metal Oxide Semiconductor Field Effect Transistor. The gate which is located between the source and drain channels is electrically insulated from the channel by a thin layer of metal oxide. The idea is to control the voltage and current flow between the source and drain channels. MOSFETs play a vital role in integrated circuits because of their high input impedance. They are mostly used in power amplifiers and switches, plus they play a critical role in embedded system design as functional elements. Enhancement Mode MOSFET – The devices are normally “OFF” when the gate-to-source voltage is zero. Both JFET and MOSFET are voltage-controlled transistors used to amplify weak signals both analog and digital. Both are unipolar devices but with different composition. While JFET stands for Junction Field-Effect Transistor, MOSFET is short for Metal Oxide Semiconductor Field Effect Transistor. The former is a three-terminal semiconductor device, whereas the latter is a four-terminal semiconductor device. Both have less transconductance values as compared to that of bipolar junction transistors (BJTs). 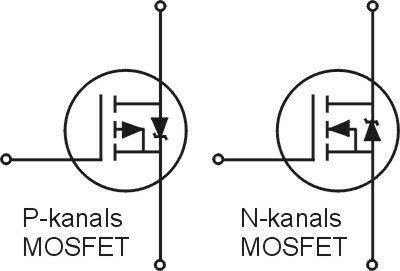 JFETs can only be operated in depletion mode, whereas MOSFETs can operate in both depletion mode and enhancement mode. JFETs have high input impedance on the order of 1010 ohms which makes them sensitive to input voltage signals. MOSFETs offer even higher input impedance than the JFETs which makes them much more resistive at the gate terminal, thanks to the metal oxide insulator. It refers to the gradual loss of electrical energy caused by electronic devices even when they are turned off. While JFETs allow the gate leakage current on the order of 10^-9 A, the gate leakage current for MOSFETs will be of the order of 10^-12 A.
MOSFETs are more susceptible to damage from electrostatic discharge because of the additional metal oxide insulator which reduces the capacitance of the gate making the transistor vulnerable to high voltage damages. JFETs, on the other hand, are less susceptible to ESD damages because they offer higher input capacitance than MOSFETs. JFETs follow a simple, less sophisticated manufacturing process which makes them relatively cheaper than MOSFETs, which are expensive because of the more complex manufacturing process. The additional metal oxide layer adds a bit to the overall cost. JFETs are ideal for low noise applications such as electronic switches, buffer amplifiers, etc. MOSFETs, on the other hand, are mainly used for high noise applications such as switching and amplifying analog or digital signals, plus they are also used in motor control applications and embedded systems. JFET and MOSFET are the two most popular field effect transistors commonly used in electronic circuits. Both JFET and MOSFET are voltage-controlled semiconductor devices used to amplify weak signals using an electric field effect. The name itself hints at the attributes of the device. While they share common attributes corresponding to amplifying and switching, they have their fair share of differences. JFET is operated only in depletion mode, whereas MOSFET is operated in both depletion mode and enhancement mode. MOSFETs are used in VLSI circuits owing to their expensive manufacturing process, against the less expensive JFETs which are mainly used in small signal applications. Sagar Khillar. 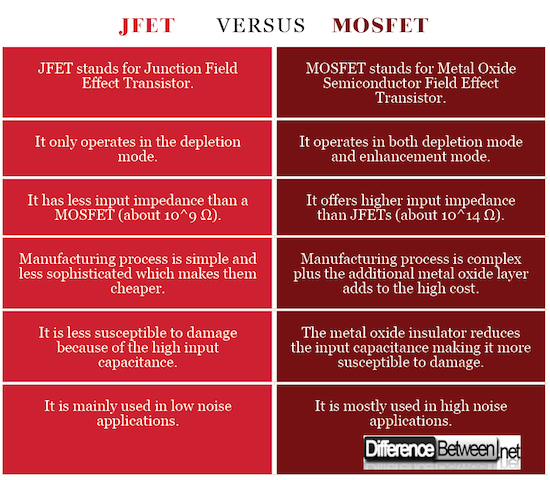 "Difference between JFET and MOSFET." DifferenceBetween.net. June 21, 2018 < http://www.differencebetween.net/technology/difference-between-jfet-and-mosfet/ >.